Jo’s story from Saturday’s post brought my attention to this box of clutter sitting awaiting decision in my craft room. It has been there for a while in the ebay staging area awaiting action. Action had been taken on a couple of items and they did not sell. Some items I am not sure what to do with while others had no business being there in the first place and ought just to have been donated already. This scanner has been superseded by an all in one printer, copier, canner, fax model some time back. It had been hidden away in my son’s room until we did a reshuffle in there when his new bed arrived. It then moved upstairs to the staging area and has been lingering there for a few months. It will now be donated to charity. 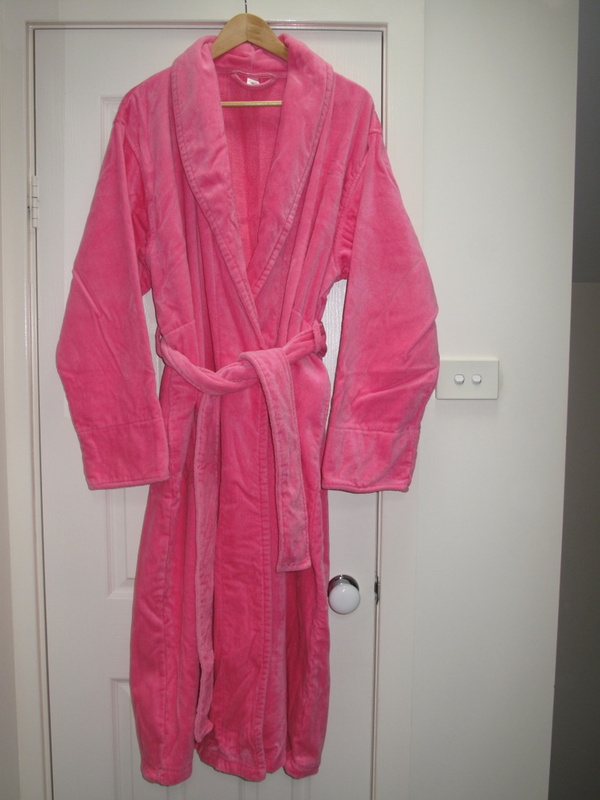 This dressing gown, believe it or not, has gone back into my closet awaiting further contemplating. See even I postpone decisions sometimes. 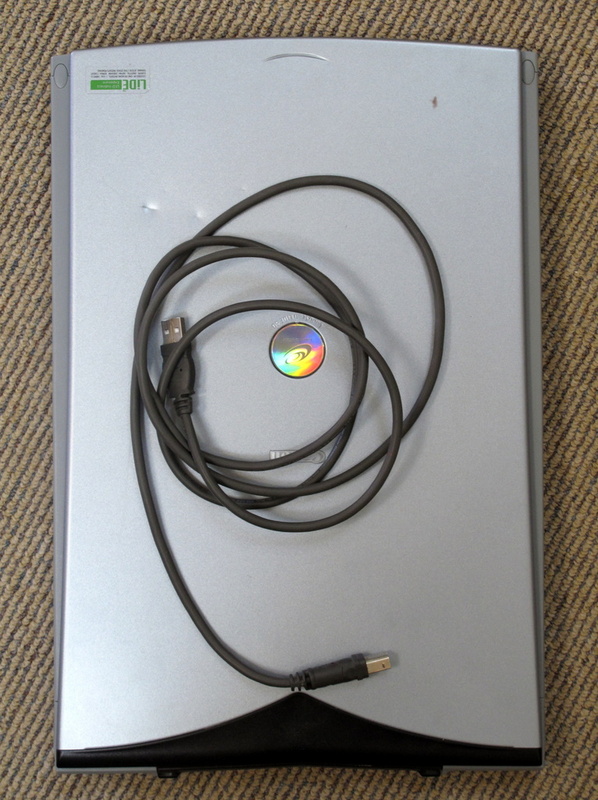 I did try to sell it on ebay without success and am now undecided as to what my next approach will be . I know I want to declutter it but I have that old “recoupe some lost money demon” breathing down my neck. I am sure I will get over it soon and decide I would rather have it our of here, but for the time being I am just going to set it aside. I have no idea what to do with these Disney collector lithographs. They really aren’t suitable for the thrift shop and I haven’t made a decision whether I will list them on ebay. I have once again put them back where they came from awaiting further investigation of the best disposal method. And you guys thought I had to all so worked out. Sometimes even I am at a loss as to what to do with things. 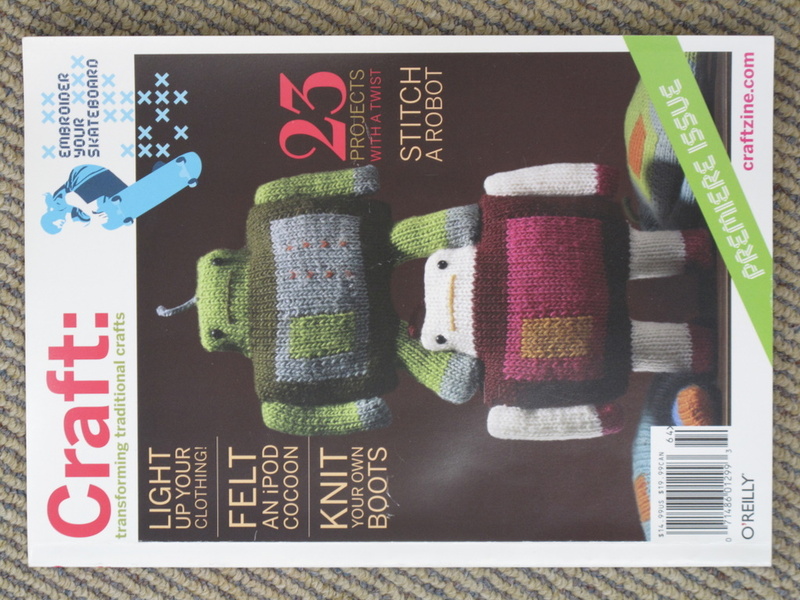 This Craft magazine however is quite simple, it will go to the thrift shop. It is something we thought about selling on ebay because its counterpart Make Magazine sells quite well. We have however decided that we just can’t be bothered with the faffing around involved. It has however been lingering there for months while we made that decision. 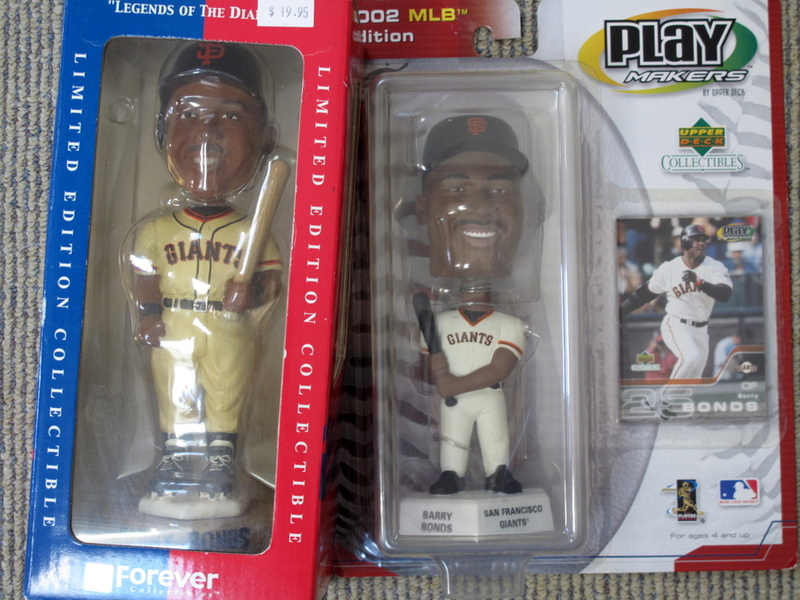 These Barry Bonds bobble heads would probably sell OK on ebay in America but not so much in Australia. I could advertise them on ebay internationally but once again I can’t be bothered faffing around with them. Finding out shipping costs blah blah blah. I could freecycle them but just our of curiosity I will take them to the thrift shop and see if they generate any interest. 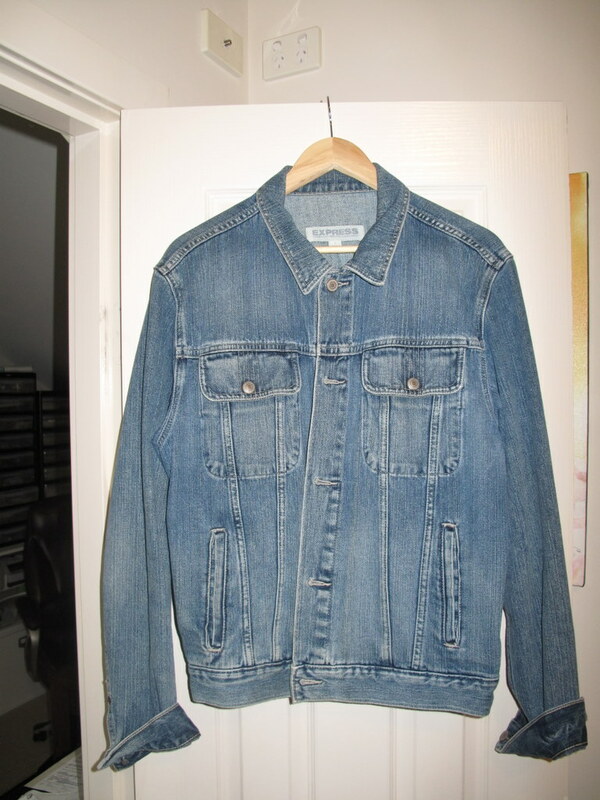 I think my husband had the idea to sell this denim jacket on ebay some time ago but yet again it got put into the “too hard basket”. There seems to be a theme going here about ebay being too much bother doesn’t there. The jacket will go with me to the thrift shop today with the other items I have mentioned. Oh my! It has just occurred to me that this jacket has featured as a declutter item on my blog already. How did it get back into the house. Outrageous!!!! 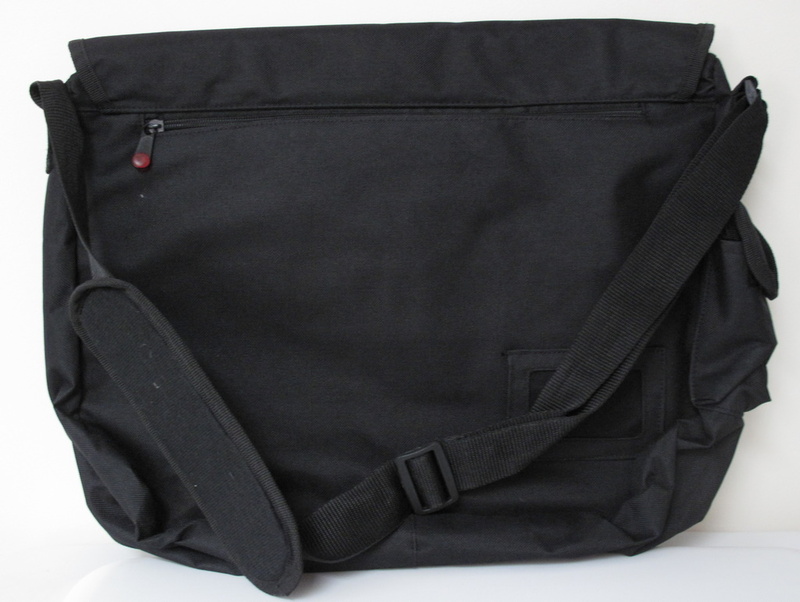 This satchel was one of the insidious freebies that are so hard to resist. I have deliberately photographed it from the back so its origin as not advertised. It has to do with my husbands work which can in some cases cause sentimentality attachment but in this case he has given me permission to declutter it. Once again I will take it to the thrift store. 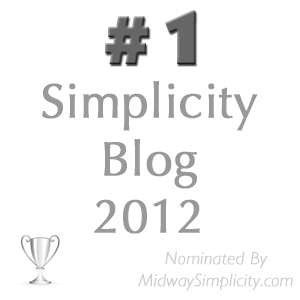 The object of this post is to prove to you that decisions don’t have to be made hastily. Each of these items were and, in some cases, are still here for reasons that only make sense to me. I have now dealt with some while others I am still undecided on. You will note that in the meantime I have continued decluttering other items as is evident by there being a photo on each weekday post I publish. So if you are having trouble detaching from certain items don’t let that deter you just move on to something simpler and easier to let go of. I’m supposed to be the expert here and yet I do it so why shouldn’t you. Just so long as you are making progress be satisfied with that and come back to the difficult things when you are ready. Sometimes the solution just falls into your lap one day when you least expect it. And sometimes the attachment just disintegrates as your will to simply grows stronger. Of course today’s declutter items are the items mentioned in the post above. These items are off to the thrift store with me today and I will be glad to see the back of them. I took the items mentioned above to the thrift shop today (now yesterday) and the bobble heads fetched $10 each for the store. The girl who bought them is very interested in baseball items so I might be able to sell her any other items that we still have lingering about the house. Also I have been taking jewellery home from the store that needs repairs and my ability to perform those repairs has rescued $23 worth of merchandise for them to sell. I love seeing the items I donate, repair and process being snapped up by their customers. This is far more job satisfaction than I got from my last paid job that’s for sure. 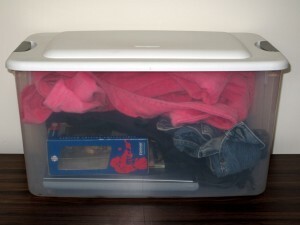 This is a timely post for me because I’ve been a bit frustrated with my inability to do any moving around my home, let alone any decluttering, since I sprained my ankle. You’ve written a great reminder that it’s ok to go slowly. Rome wasn’t decluttered in a day. I started my declutter while bedbound – it is possible. Unless you live alone, get someone to put any drawers you want to attack on your bed beside you. Then you have plenty of time to sort, and decide. Stuff flung on the ground on my husband’s side of the bed was to donate, stuff over the end of the bed was recycle, stuff over my side was to be washed, stuff replaced in drawer got put back where drawer belonged when my husband got home! It worked better than you could imagine, and I was more motivated at that time because there was little else I could do that was useful. when you have an injury it is probably divine intervention to make you slow down for a while. Take it easy and relax until you are properly back on your feet. If you get really frustrated just get The Professor to do it for you. ;). We have got to clutter discussion time here at our house. I have cruised along for a while doing this and that but now we have got to a point again where we need to discuss what direction we are going in next. Maybe that would be a good thing for you to do while you are laid up. Great idea, Colleen! I’ve been able to seriously declutter papers and files on my computer but the other things, well, I need physical help. If like Ann suggests, I get The Professor to help me, he’s involved in the process–this weekend, my drawers! I so agree with your point that if you’re not ready to declutter something today, there’s no shame in holding on to it and moving on to something easier. This has worked wonders for me. I’m also comforted to know that someone else finds eBay not worth the hassle. I can just barely stand to list an item, but I hate, HATE shipping it. I’ve resolved (again) that unless something is worth more than $20 it’s not worth the hassle of selling it. I also find it psychologically easier to donate goods than cash for some reason, so donating to a charity thrift shop is a win-win. we are obviously in like minds about this subject. This is why I decided to declutter this way in the first place. And ebay, I am so over that. It isn’t just about the hassle, It’s about all the fees that could go to waste if the item doesn’t sell, it is about hoping the person is happy with the sale, it’s about ebay changing the rules to make it harder and harder to make a profit out of the transaction… In the end I think it is more about the mental hassle than the physical effort involved. thanks for that important information. I wouldn’t mind paying the 7.9% on stuff that sells well. Yahoo! I really should keep up with the new rules but they have been so out of the sellers favour recently that I just stopped updating myself. I have always thought it would be good to an Expressions of Interest section on ebay so you can know that things will sell before you waste money listing them. This is a good as that. Thank you again. I actually took some real art graphic prints (by a name artist) to the charity thrift shop. I could have given them to a family member but at the time I just didn’t feel like cluttering anyone else’s life (though they would not have seen it that way). Anyway, I don’t think we should just donate non-sellable stuff. I have sold some stuff but never when I felt overwhelmed by it or started to procrastinate and it would just linger. Then it just wasn’t worth it and off it went to the charity shop! having worked in the thrift store for a little while now I have found that there is very little that they don’t sell. Sometimes they just about give it away like this week we have 6 Videos for $1 and some clothing items for $1 each and fill a bag with coffee cups for $1. That being said, every dollar counts so so long as they are selling for something they are helping. Of course sending garbage like stained clothes, used underpants, any item that might be a health risk like old used electric razors, drink bottles, and toilet brushes ~ just a few of the things that came in this week at my store ~ is a waste of money for the store because they have to dispose of it. We also get many extra good quality item that fetch the store some great prices. 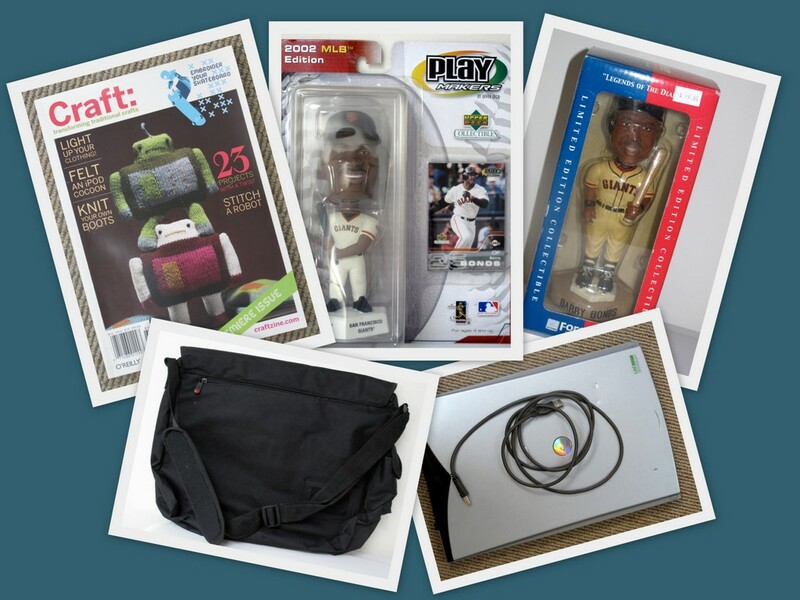 Old ceramic items, collectables ~ like the baseball items I donated yesterday ~ furniture and electrical goods. You are right it is nice to just donate some good stuff just to be charitable and I am sure we all do that at times. I know I do and I get such a thrill when I see it sell for them. Perhaps you could give the dressing gown to a women’s shelter or someplace like that where it would make someone else feel cozy. that is a good idea. I must look into that as I would feel good doing that for sure. I will put it on my google list for today. I had a pile of items that were vintage that I couldn’t bear to take to a thrift store but I don’t have the time, equipment or inclination to be bothered with trying to sell them on ebay. I ended up taking some items to a local mom and pop antique store and just handing them over. I know that the hand carved wooden elephant will go to a nice home and I’m completely ok with that. I’m past trying to recoupe money for my items, I just want them gone to an appropriate place. My daughter also found a website where you can donate those really special used stuffed animals. They repair and clean them and then donate to various organizations. welcome to 365 Less Things and thank you for leaving a comment. At the thrift store where I work the manager has experience in identifying items of greater value such as ceramics and collectables and prices them accordingly. We also have a lot of customers who come in looking for just that sort of thing. I made a sale of two tiny ceramic dogs last week that netted the store $30. They just looked like rubbish to me worth $1 each. The charity is lucky to have someone like my manager working for them. I can understand why you are past trying to recoupe money for your stuff. It is almost more bother than having it cluttering up the home in the first place and causes a whole lot of procrastination. I think the chances of accidentally decluttering something worth a fortune in pretty slim in most cases. Hi Colleen, it’s really great that you can see first hand the results of taking items to the thrift store, so you know that it’s really helping them! I donated some items to a friend’s garage sale which didn’t sell. One of the local charity shops took everything that was left over after the sale and when I went into their shop, I saw a couple of things that I had donated. I was quite tempted to buy back one of the handbags (I had bought it on holidays in England) but then I remembered that it was too small to be useful so I stopped myself from buying it! it is a good experience I must admit. The charity I work for runs hot lines for people with emotional problems like contemplating suicide so it is very important that they keep their funding up. I had never really thought about the connection to the fact that my stuff could be actually be helping save lives. I am glad you didn’t re-buy that handbag. I have to admit I had my eye on a couple of things at the thrift store yesterday but I went home empty handed. It’s amazing how quickly decisions have to be made when selling a house! I’ve had a kids’ electronic keyboard (not being used) hanging around for ages. I asked a friend if she wanted it and she said no. Too much hassle selling it on ebay so yesterday I put it on the nature strip and it was gone in minutes. The mental relief is huge! Of course, when I told my friend what I did she said she regretted not taking it. Oh well, I can’t keep stuff lying around just ‘in case’ someone wants it later. Oh, and when the Real estate agent brought the photographer around, they were asking for knick knacks to use in the photos and I didn’t have any! We had to improvise with books and some souvenirs from my daughter’s room. Ha ha. I also have a keyboard (lingering)to sell and would really like to make some money on it for my daughter. It is proving to be more difficult than I hoped but for my kids I make an extra effort, too much effort sometimes. I was thinking of googling music teachers in my area and let them know that I have a keyboard for sale. This sounds like a good option to me. I will let you know how I went. You must have been feeling quite smug with that real estate agent. I had a similar yet oposite experience when the newspaper came to photograph my home for the story on my blog. First of all I thought they just wanted to photograph me, thank God my house is normally very tidy or that could have been embarrassing. But they were expecting a minimalist house with nothing much in it while my house still looks like a family home. They were clearly trying to put a slant on my story that just wasn’t there to have. Your house looked lovely (yes of course I had a sticky beak) and – from memory – the kitchen was quite minimalist, and gorgeous. Are you still coming down in October? I sent out some emails to music teachers yesterday so we will see what happens. I do like my kitchen, it isn’t perfect but it is more than adequate for my needs, compact but a good layout. And yes I am still coming in October, we arrive on the 14 and have the weekend there. Do you think we could get together somewhere. I am going to be out at Chelsea Heights if that means anything to you. I have forgotten where you are, is it a long way from Chelsea Heights? I for one find it quite comforting to know about the items you have lingering, Colleen. Thank you for this post. Also, I have really found it helpful to keep being reminded that if we are stuck on something to move on. I think it might finally be planted between my ears now, but it took a good many times of reading it to get it there. so long as the information sinks in eventually you stand a chance my friend. These aren’t the only things on the back burner either, there are photos and keepsakes and more craft supplies. Progress is all that matters not what order the stuff leaves in. Colleen, I love your expression “faffing about”. It really expresses it well. I’m another one that can’t stand to list on Ebay any more. Too much hassle for too little return most of the time. I can really relate to your post today. I’ve been trying to decide for over a year now whether or not to get rid of some of my art supplies and old artwork. Finally, this week, I suddenly, painlessly, made the decision to get rid of it, and I don’t think I’ll have any regrets. I passed on things like paints and colored pencils to my grandchildren. I recycled a ton of old magazines and some books that I had been “going to” use in collages and for altering. I even went through some old artwork that I don’t care about any more and threw it into the recycling bin. Thinning this stuff out has given me quite a bit more breathing room in here. I have been in my craft area a bit over the last week of two sewing a new duvet cover for my son. The more I am up there the more I would like to see the volume of stuff reduced. I think I am going to have to spend some time weeding more stuff out again soon. I would like to see that space open up up there.